June 30, 2015 -- I love Germany with its food, culture, and wonderful countryside. A favorite spot for me is the Bergisches Land. The border between the Sauerland and the Bergisches Land is made up of the Wupper-Ennepe Basin, and it is also the border between the Rhineland and Westphalia. It is in this beautiful part of Germany that Wilhelm Conrad Röntgen was born at 16:00 hours on 27 March 1849. The house where he was born was at 287 Poststrasse (and now numbered Gaensemarkt 1) in the lovely town of Remscheid-Lennep. The house in the old town was built in the early 19th century and is half-timbered. The design is typical for Bergisch housing at that time, and reputedly the timber used in the construction of the house was felled between 1783 and 1785. The house has a cellar, two floors, and an attic. Inside the house, the original techniques used in its construction can be made out. The house was given to the city of Remscheid in 1964, and it was purchased by the German Radiological Society (DRG) in 2011. Röntgen's father, Friedrich Conrad Röntgen, was born in Lennep on 11 January 1801. He came from an old family of Lennep merchants. His mother, Charlotte Constanze Frowein, was born on 28 February 1806 in Amsterdam. Wilhelm was an only child, and his parents were first cousins. He lived in the house until he was 3 years old, when his parents moved to Hoofdstraat in Apeldoorn in Holland. There were family connections in Apeldoorn, which is where Röntgen's grandparents lived. For me, the birthplace of Röntgen is a very special place. I visited it when I attended the German Röntgen Museum (DRM) and was thrilled to have been able to sleep in the flat in the attic. There was a chamber pot under the bed, which presumably did not belong to the Röntgens! Interestingly, the initial plan was to locate the DRM at the birthplace, but this was not possible at the time. 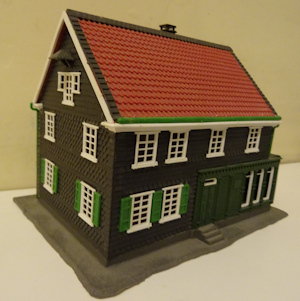 Self-build plastic model of Röntgen's birthplace purchased at the German Röntgen Museum (DRM) and assembled by the author! The plans for the birthplace are exciting, and there is an opportunity, in combination with the DRM, to present the life, work, and lasting influence of Wilhelm Röntgen in a more comprehensive and interesting manner. This should be important to all radiologists. On the ground floor there will be an exhibition open to the public. The half-timbered walls are being restored to how they would have appeared in 1840. Personal belongings of Röntgen will be displayed, and visitors will be able to get a feeling for the personality of this great man and of his simplicity and modesty. The upper floor will have a fully equipped conference and meeting room, which can be used with the permission of the DRG. A second room is a "Röntgen Club" that will serve as a lounge with books and a display about the early days of radiology. 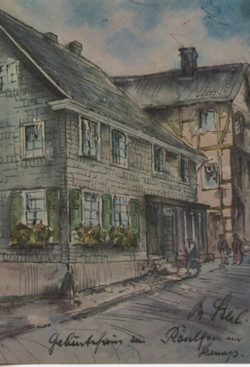 Birthplace of Wilhelm Conrad Röntgen by artist Josef Steib (1898-1957). The attic has an apartment that can be used by scientists and guests. It can be used as a place to stay when writing about Röntgen and radiology. This will be an inspiring space that will give scholars and students a special place for thinking and studying. Such an exciting project obviously involves an input of both time and money. There is much to do for the renovation of the building, and inside there is the exhibition to design, with the conference and guest rooms. Much has been done already and a Foundation for the Birthplace of Wilhelm Conrad Röntgen has been set up. We can all help this wonderful project by either giving a donation ourselves or by telling others about the work of the foundation. The foundation's website has all the details needed for donating and information about the project. There are four donation categories ranging from bronze (500 to 2,499 euros) to platinum (more than 7,000 euros); however, any amount is welcome. This project is important for all those involved in the radiological sciences and is warmly recommended. Do please consider making a donation. This project is important for all of us. 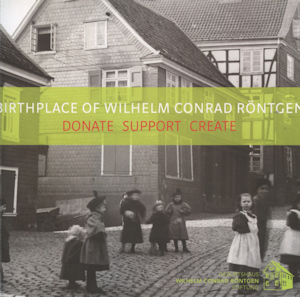 "Donate Support Create," the booklet of the Foundation for the Birthplace of Wilhelm Conrad Röntgen. A copy of the brochure "Birthplace of Wilhelm Conrad Röntgen -- Donate Support Create" can be downloaded from the above website or ordered via e-mail. 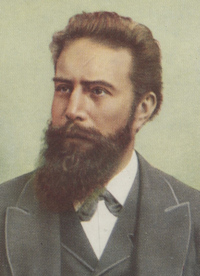 Glasser O. Wilhelm Conrad Röntgen and the Early History of the Röntgen Rays. London, U.K.: John Bale, Sons & Danielson, 1933.